The Re-Stash jars are the absolute best choice in glass storage for your dry herbs and botanical materials. It’s no secret that the best way to keep your dry herbs fresh for as long as possible is to put them in a glass jar. But keeping your dry herbs away from light and heat is also rather important. And sometimes, you need a little extra protection from those who might try to find their way into your stash jar. The ‘Re” in the Re-Stash jars stand for recycling, because each one of these glass mason jars are made from 30 percent recycled materials. What better way to keep your buds fresh, safe and secure while saving the environment at the same time? Storing your dry herbs in plastic containers of any kind, for any period of time, can cause static cling, which lessens the quality of your dry herbs and degrades their terpene profiles. This is why you should always store your dry herbs in glass. 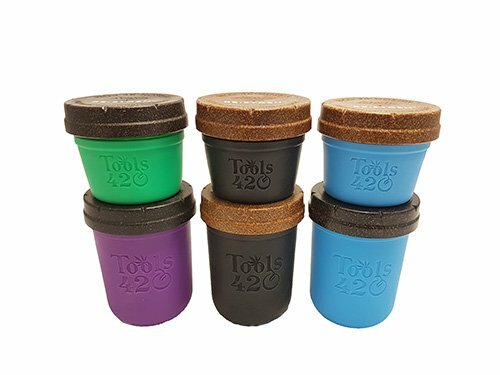 The non-toxic, harmful chemical-free silicone that each Re-Stash jar is wrapped in is made from sustainable resources that don’t hurt the environment. Silicone can resist extreme temperatures – at subzero temperatures and intense heat over 400 degrees Fahrenheit. The child-resistant lids of the Re-Stash are made from polypropylene that is reinforced by bio-fiber. Instead of using elements that require energy to produce, the bio-fiber lids are made from a waste product. Do your part to protect the environment and little wondering hands at the same time. U guys are doing good by me, I will be back.